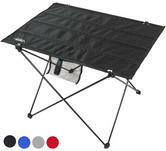 The Andes® folding camping table is great for outdoor activities like camping, picnics, beach parties and travelling. You could even use the table inside. Opens and folds in seconds. Small pack size for easy storage and transportation (78cm x 8cm x 8cm). The table top is made from 900D polyester and the frame is made from 6061 aluminium alloy. The table also has 2 x mesh storage pockets and anti-slip feet. Length: 75cm x Width: 55cm x Height: 52cm.